Backed by rich industry experience, we are engaged in providing a premium quality range of Swirl Diffuser. 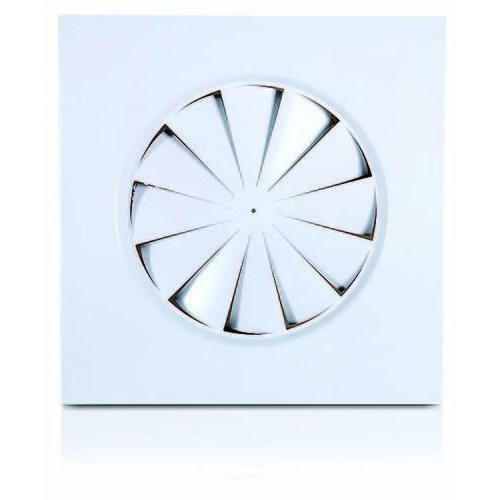 MAPRO make Swirl Diffuser (MSWR Series) is an efficient alternative to conventional square or round ceiling diffusers as they produce aerodynamically controlled air pattern which promotes high induction and provides rotation to room air and led to increases mixing effectiveness. The unique style of this diffuser will provide an aesthetically pleasing appearance to any architectural application. Backed by rich experience and expertise, we are reckoned as leading manufacturer and exporter of a highly durable range of Axial Flow Fans, Jet Fans, Inline Fans, Centrifugal Fans, Air Diffusers, Air Grilles, etc.